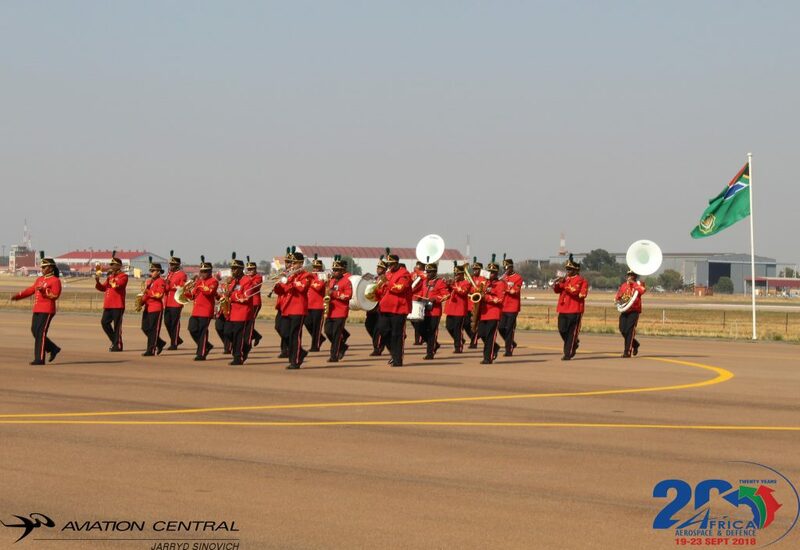 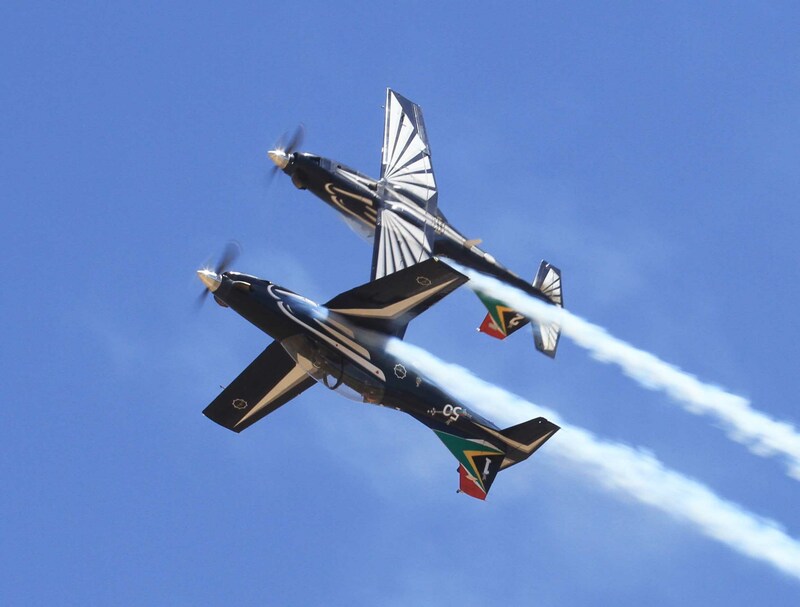 This show dates back to when DEXSA 1975 ,The Africa Aerospace and Defense (AAD) Expo was born from the Aerospace Africa civilian exhibition that originates from the 1975 Lanseria Air Show and the DEXSA military exhibition. 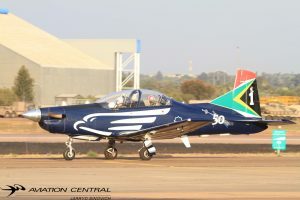 “South Africa views the role of the military in the modern context as a developmental force, both nationally and continentally”, this is the view from President Cyril Ramaphosa in his opening address of the 10th Africa Aerospace and Defence exhibition, taking place from 19 to 23 September at the Waterkloof air force base in Pretoria. 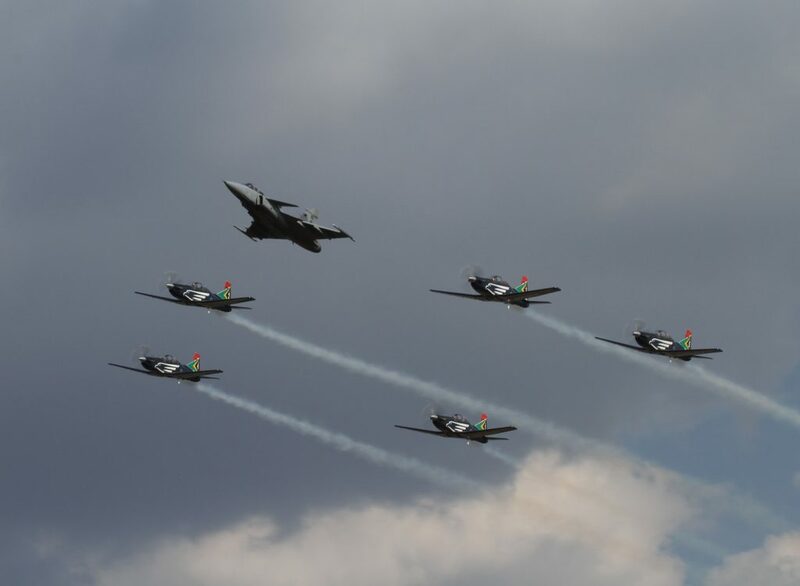 According to the President, the show brings defence agencies and defence industries together in reflections on the evolution of security – and how they must each adapt to the requirements of the future. 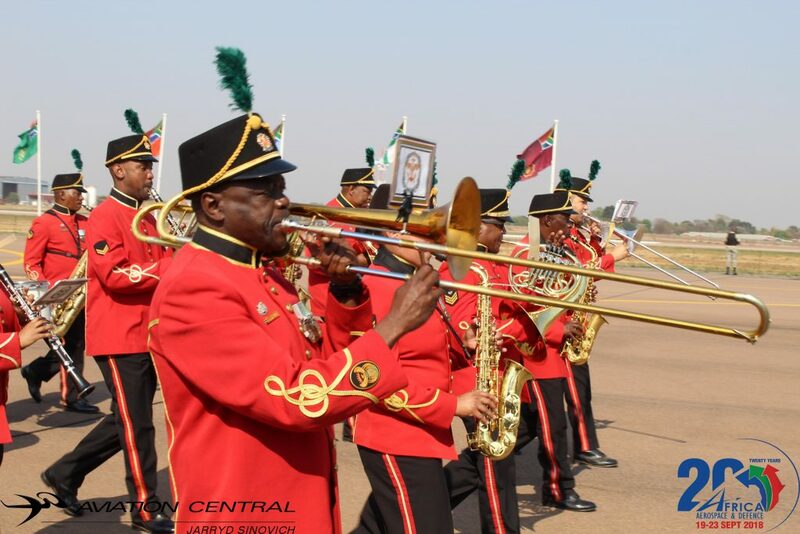 As far as internal security is concerned, the defence force must always be ready to provide additional capacity to maintain order and stability within the relevant governance framework. 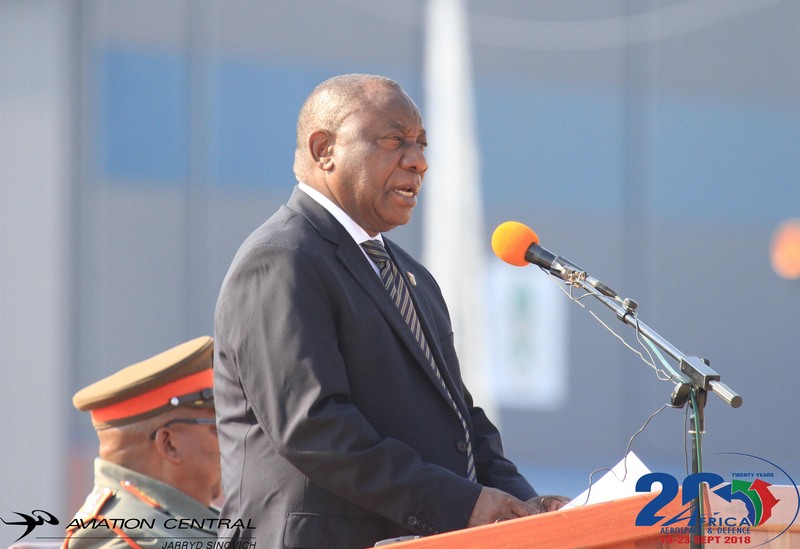 Whilst the government continues to prioritise socio-economic objectives that provide the best possible future for the youth, he was adamant that the economy is under pressure pointedly saying the means available in the fiscus are finite. 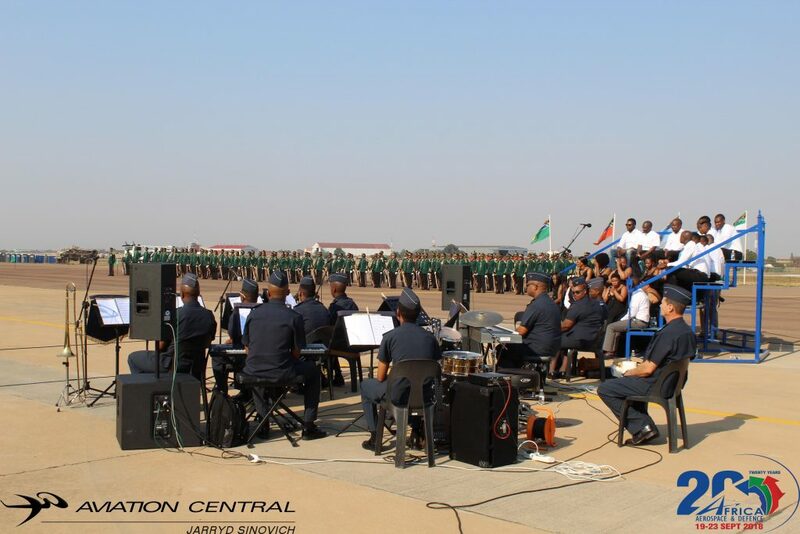 The President acknowledged that the South African National Defence Force was adapting to this economic reality.In this regard, the SANDF was prioritising within the implementation of the Defence Review by focusing on the core roles of the defence force. 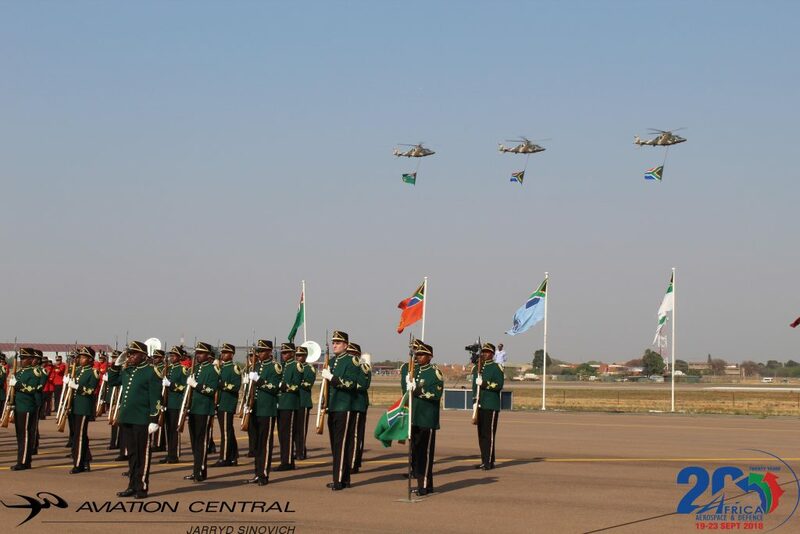 He said several ideas were being explored to modernise the funding model of defence and reduce its dependency on the fiscus. 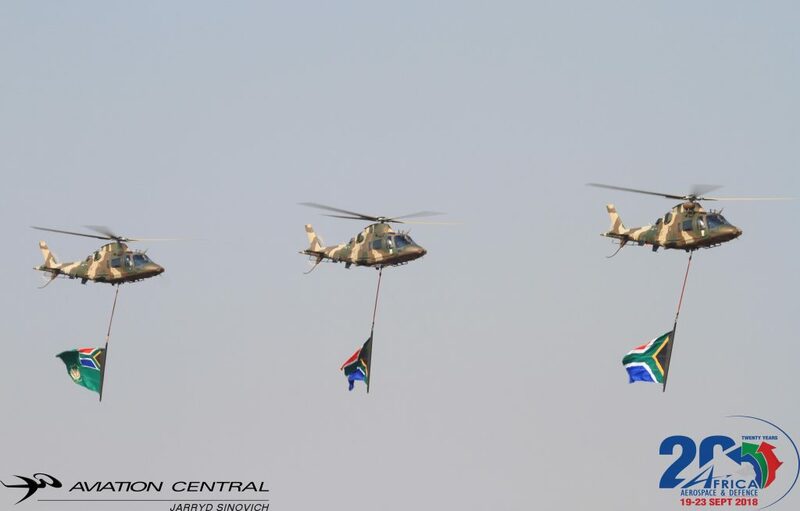 Still, for both security and developmental reasons, South Africa was looking after its defence industry. 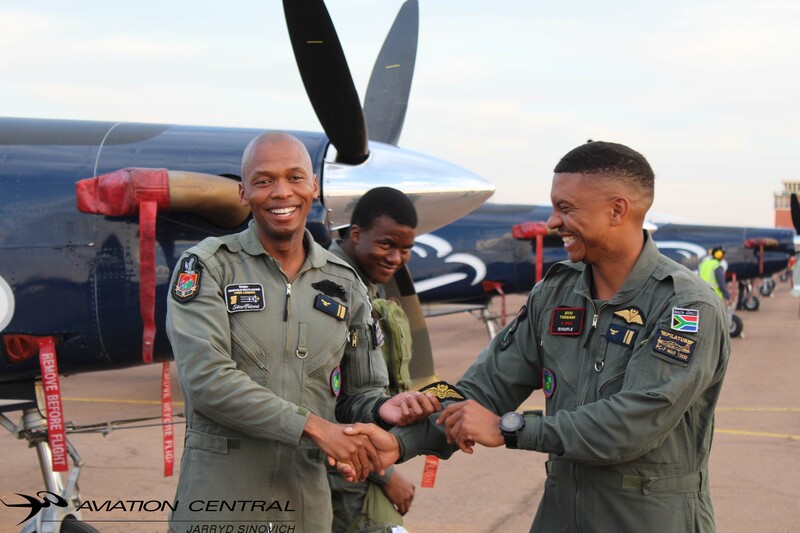 The President noted the industry’s role as an important employer and an incubator of scarce skills in science, technology, engineering and mathematics. 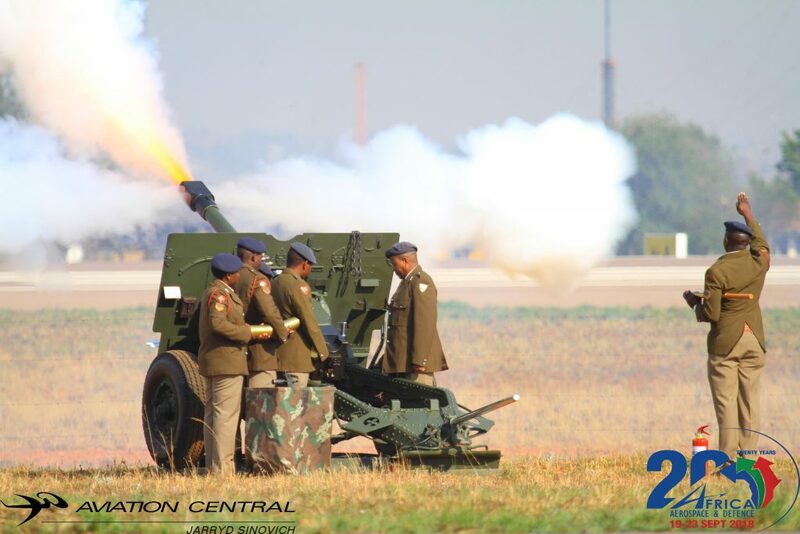 In support of the industry, he outlined the many initiatives to maximise the value of the defence industry, notably the Defence Industry Strategy developed by the National Defence Industry Council, a Defence Sector Charter developed to open space for private participation by small and medium black enterprises and a defence industry fund that was launched in June this year as a funding mechanism for industry. 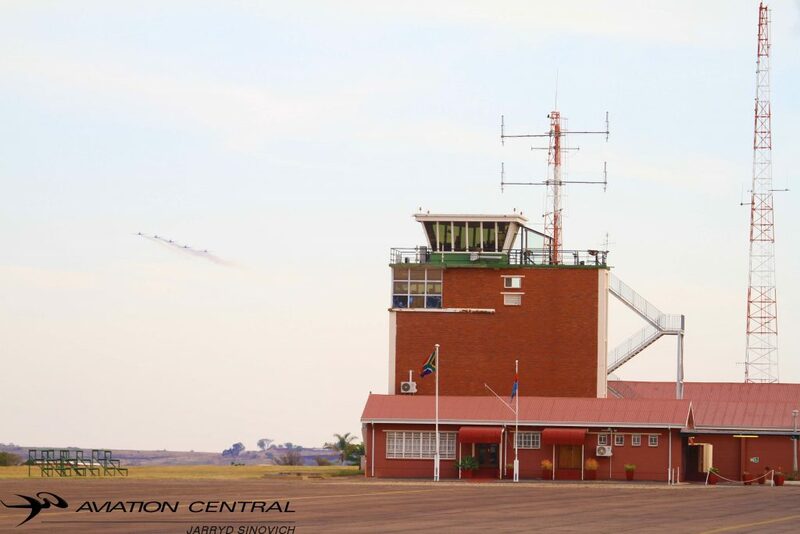 Government intends to support the industry to become export-driven on the back of international investment, by having a policy stance favouring international joint ventures with local industry. 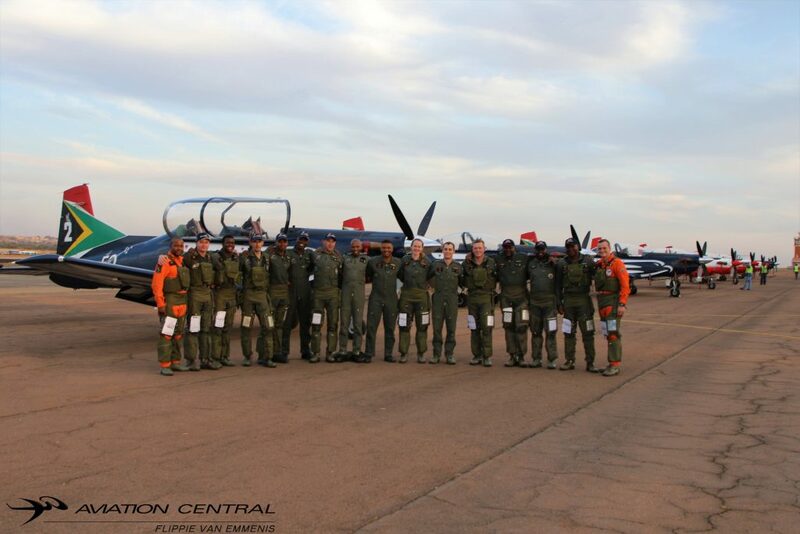 He noted defence industry investment destination, South Africa combines many unique factors. 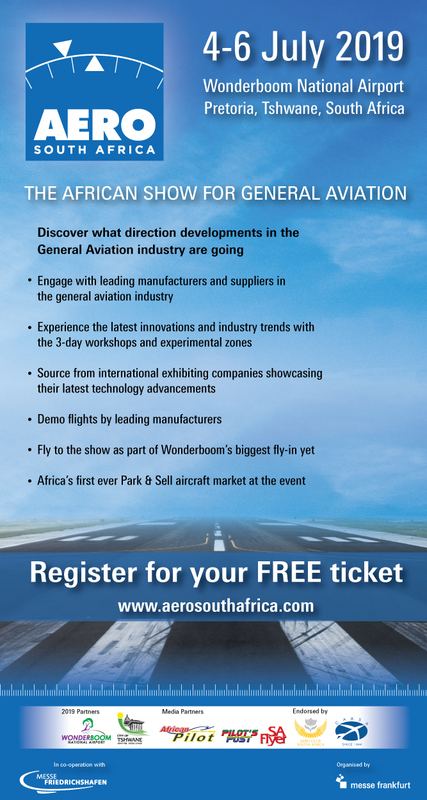 Local industry still tends to own the full supply chain necessary for conceptualising and manufacturing their end product. 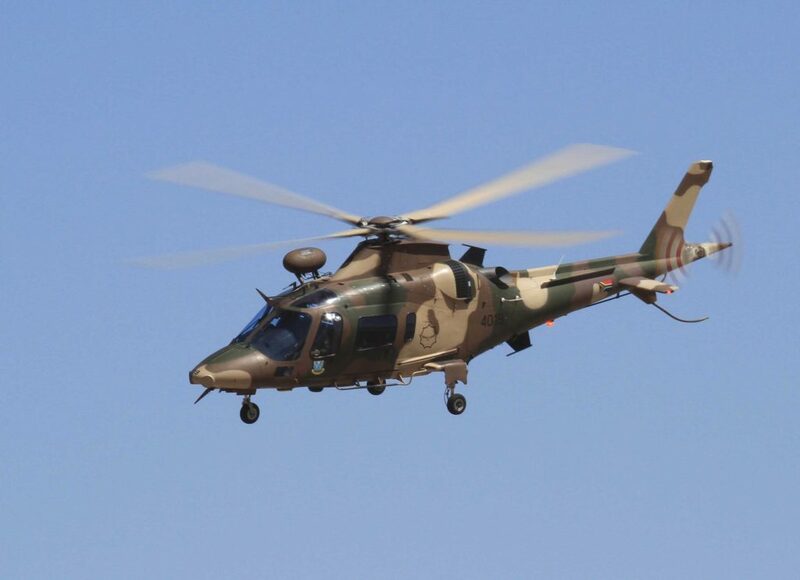 Unlike many international ventures, defence production in South Africa does not imply multinational interdependency. 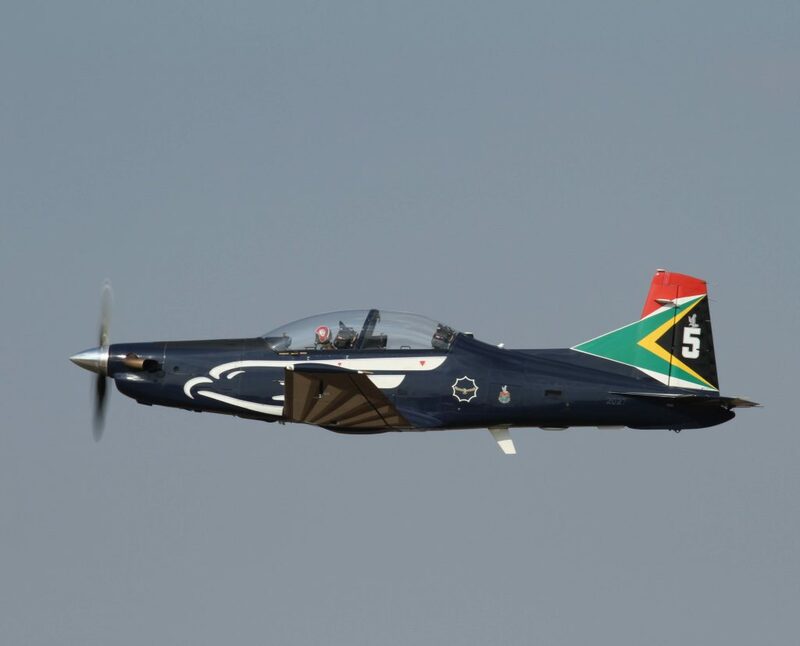 In terms of intellectual property, South Africa is one of less than ten countries that can manufacture missiles of a certain level of sophistication. 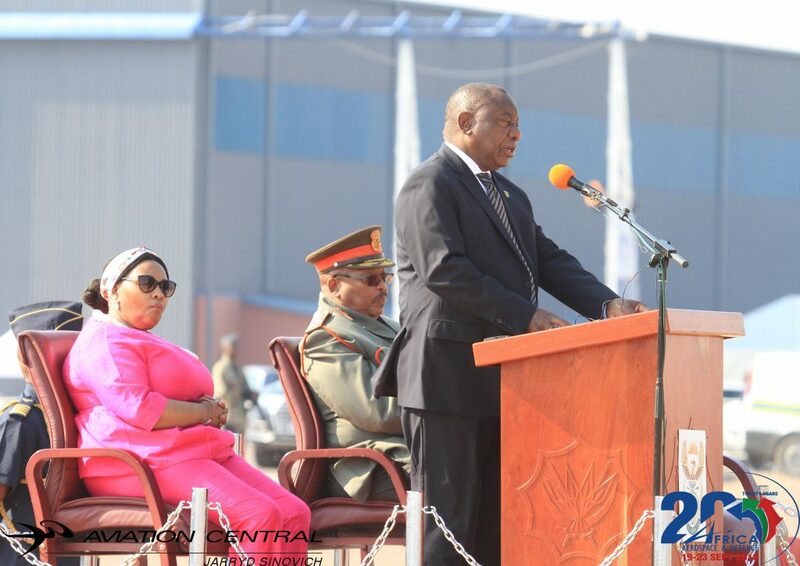 He used this as an example, saying the development of intellectual property into technology demonstrators is very cost-effective due to the exchange rate between the rand and the major international currencies. 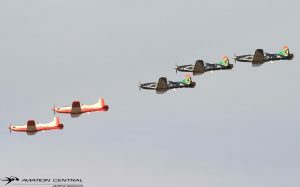 A flypast from nine PC7MKIIs from the Central Flying School concluded the ceremony. 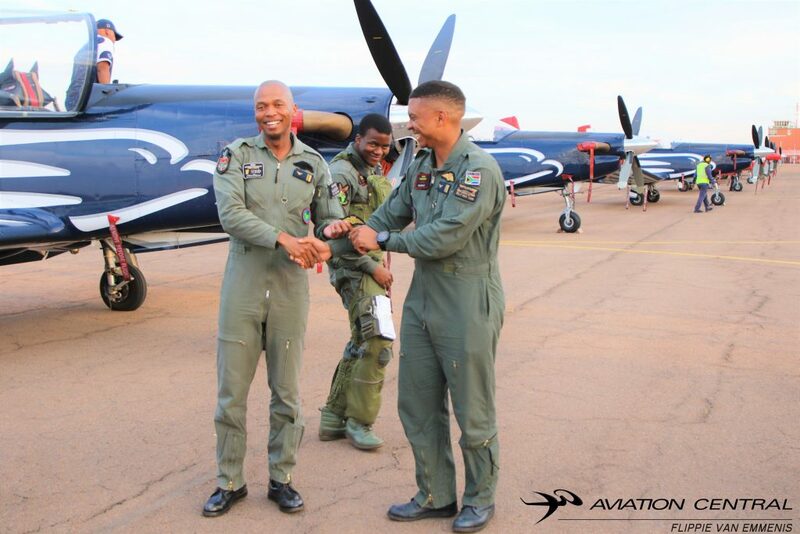 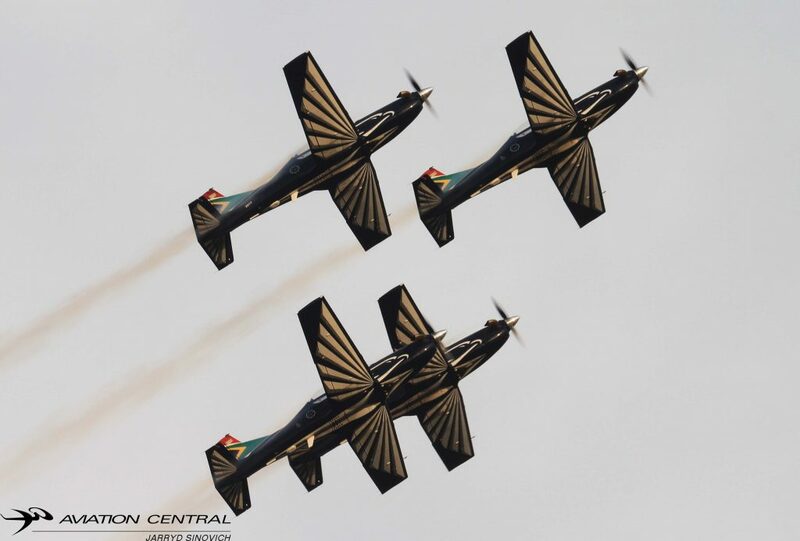 Omphile Mutloane who is currently the number 5 in the Silver Falcons Aerobatic Team, known as the soloist in the team with the call sign “Biggy”.The team is the official aerobatic team of the South African Airforce, the team is 51 years old in 2018. 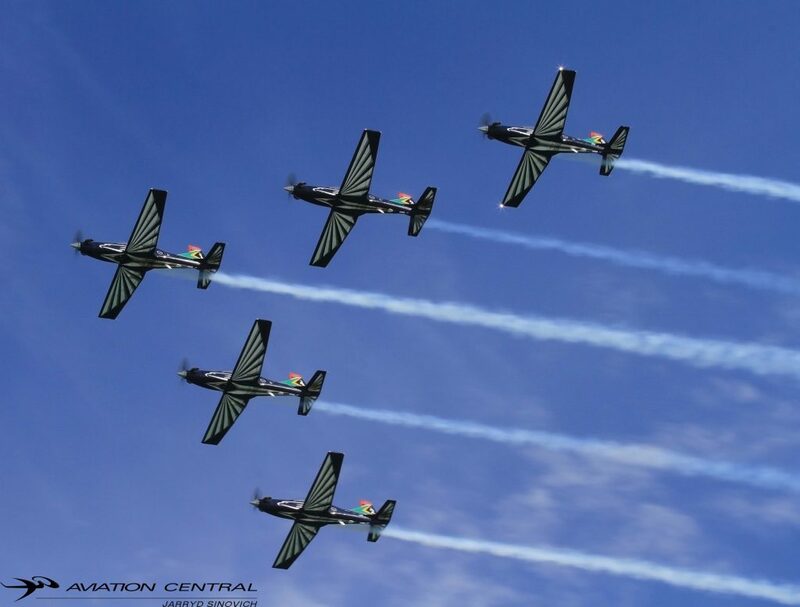 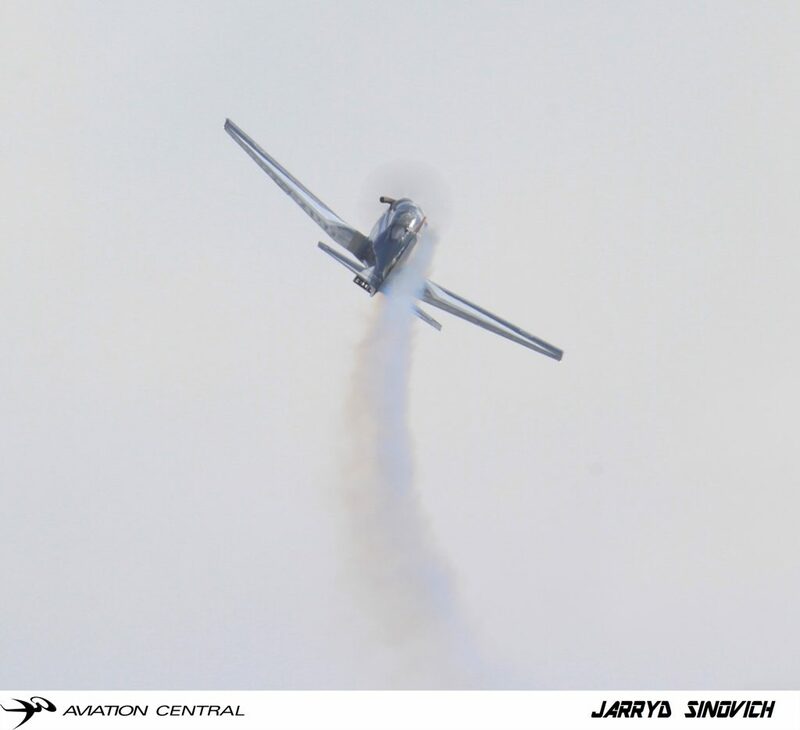 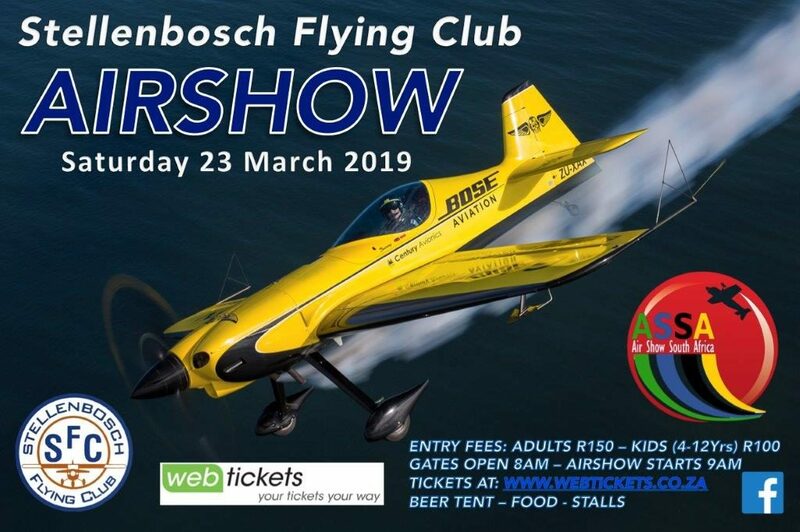 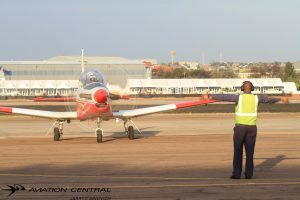 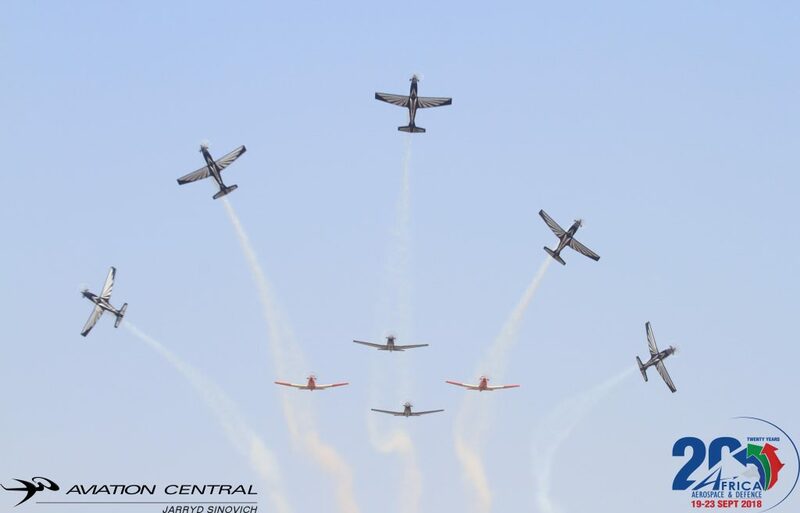 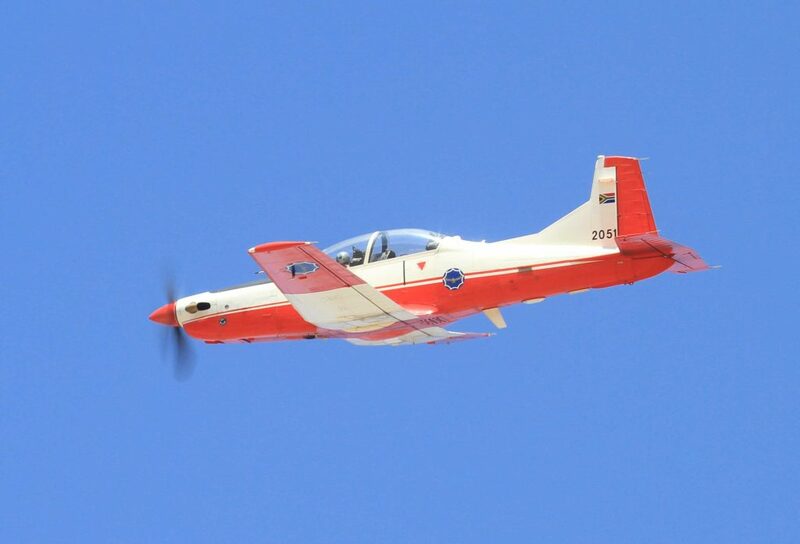 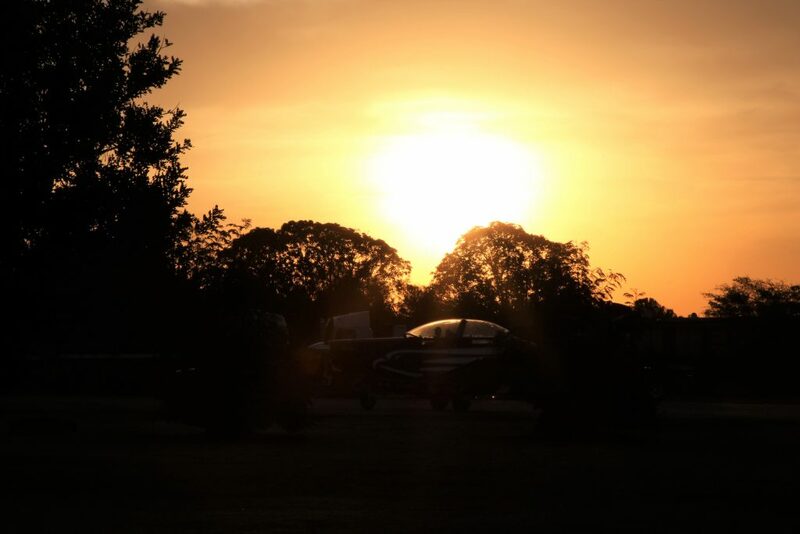 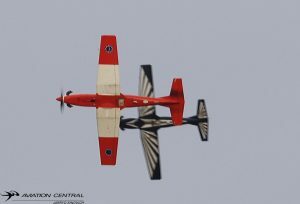 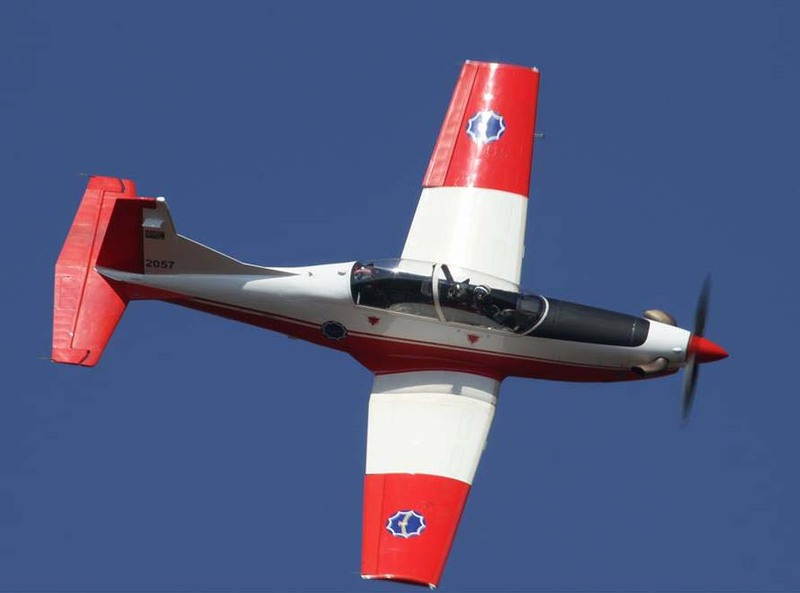 The team celebrated their 50th Anniversary last year with an airshow at their home base at AFB Langebaanweg on the Capes West Coast.Originally formed in 1946 as the Bumbling Bees and flying the T-6 Harvard and then the de Havilland Vampire. 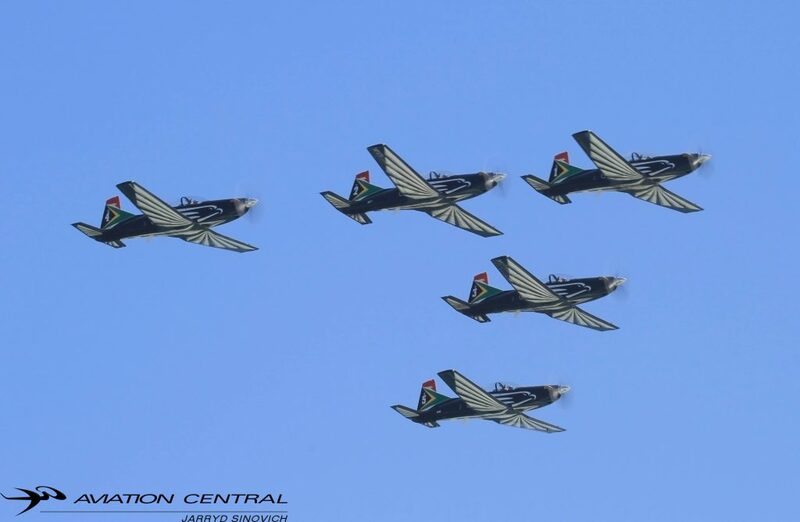 The Bumbling Bees flew a 4 ship formation and made a name for themselves by regularly taking part in South African airshows. 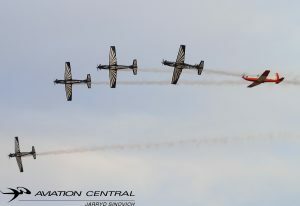 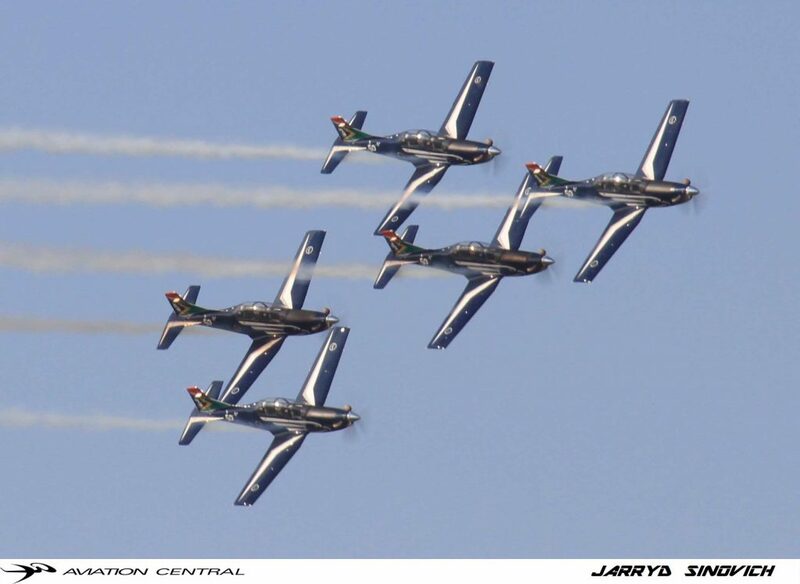 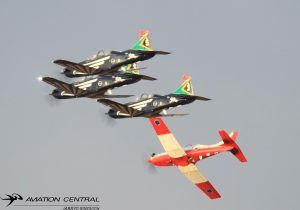 The team disbanded in the late 1950s leaving a gap in South African aviation.The indroduction of the Pilatus PC7MKII in 1995 put the team back to a 4ship and then in 2008 the team went back to a 5 ship and painted in the Silver Falcons livery. 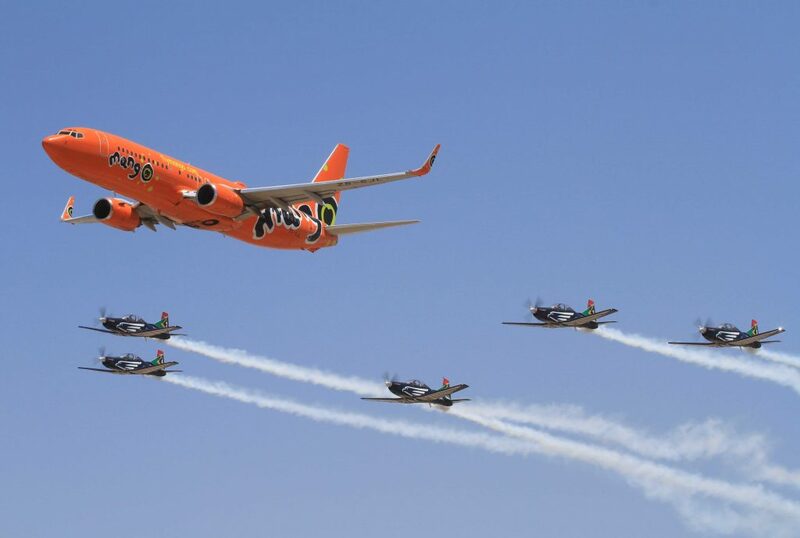 Aircraft were always flying high overhead the village Omphile stayed,but never did himself and the children around him at the time get the opportunity to get up close and personal with the real thing. 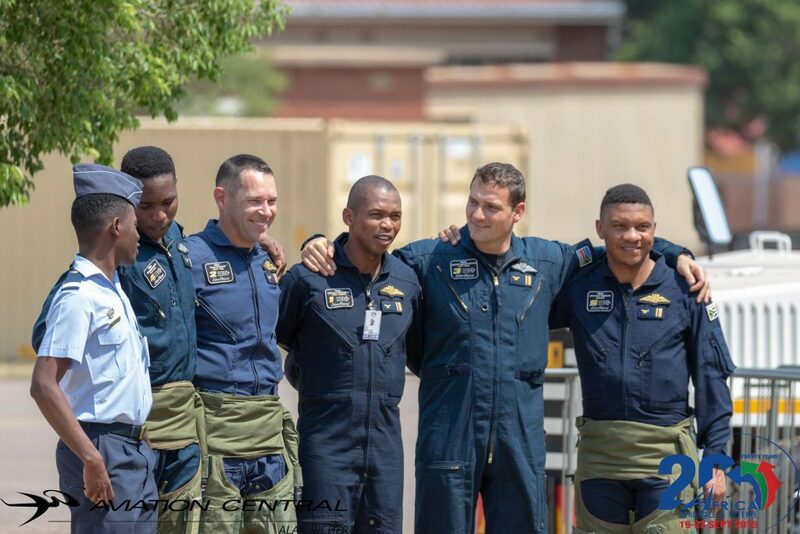 That one moment of the SAAF helicopter crew pretty much changed Omphiles life, from that time on he was determined not to have a plan B in his career. 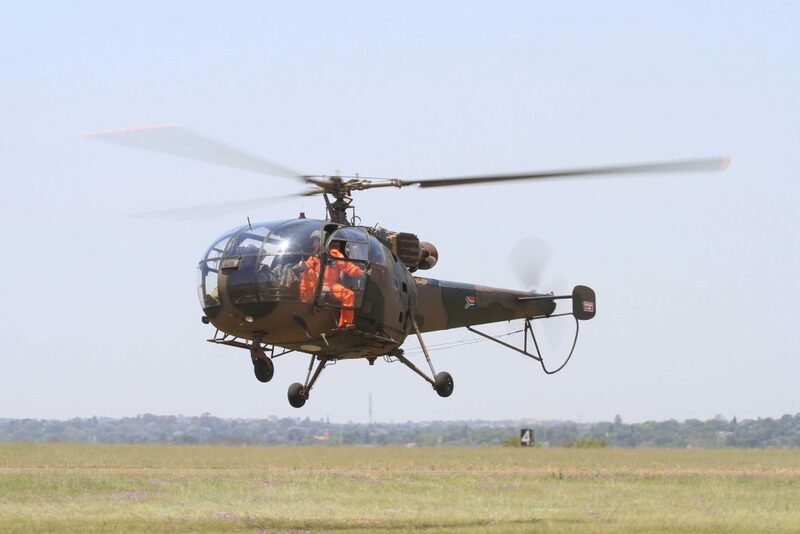 Plan A was to wear the green overalls and the well know green chopper helmet. 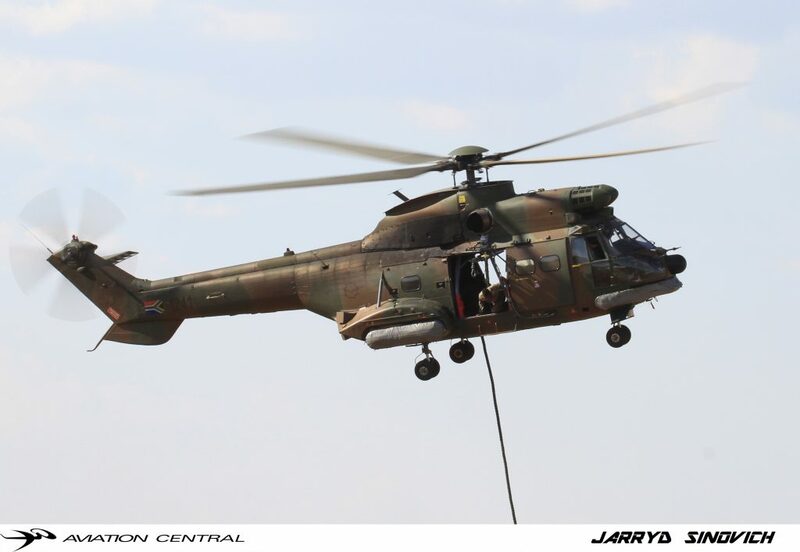 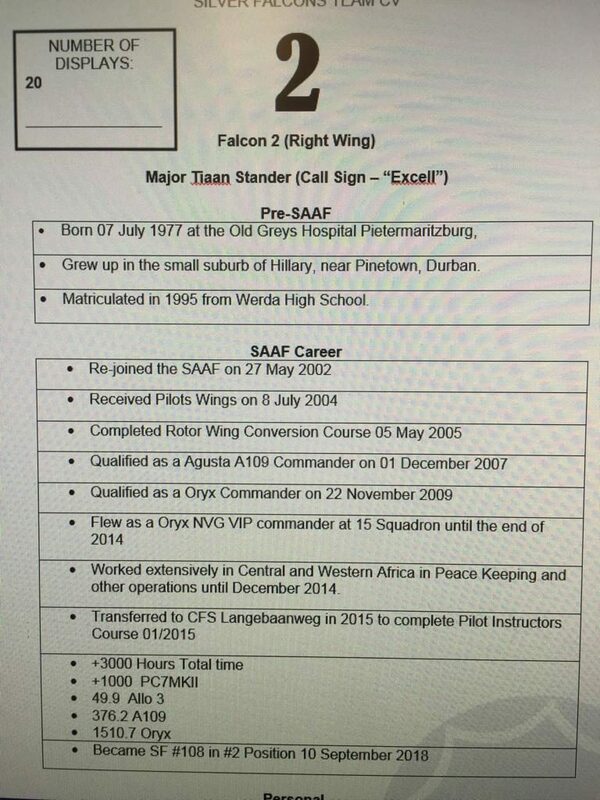 I served as an Oryx co pilot at 17 squadron in Pretoria from Jan 2009 until November 2012. 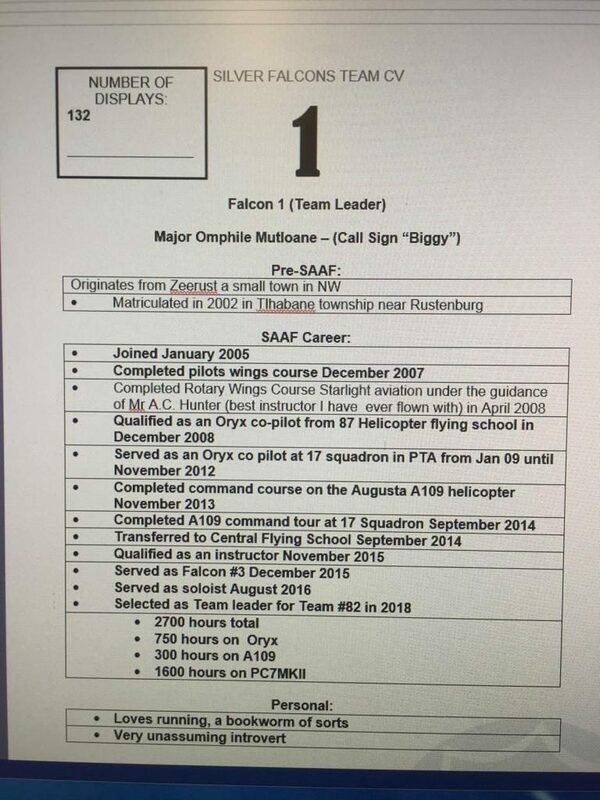 I did my command course on the Agusta A109LUH in 2013.In 2014 I was posted back to AFB Langebaanweg to become a instructor and subsequently did the famous falcon ‘fly-offs’. 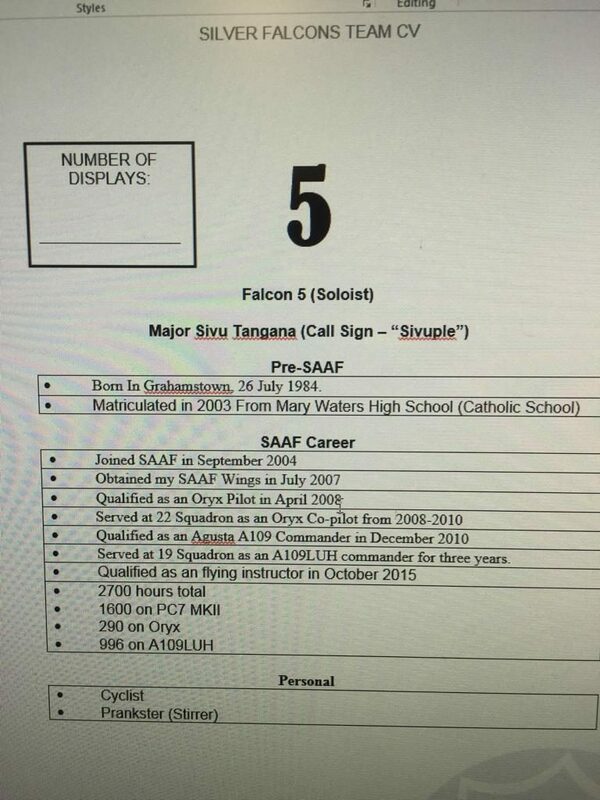 The fly offs are basically a selection of instructors who want to join the Silver Falcons and I was able to join the team in October 2015 as the number 3,then moved to the singleton as falcon 5″. 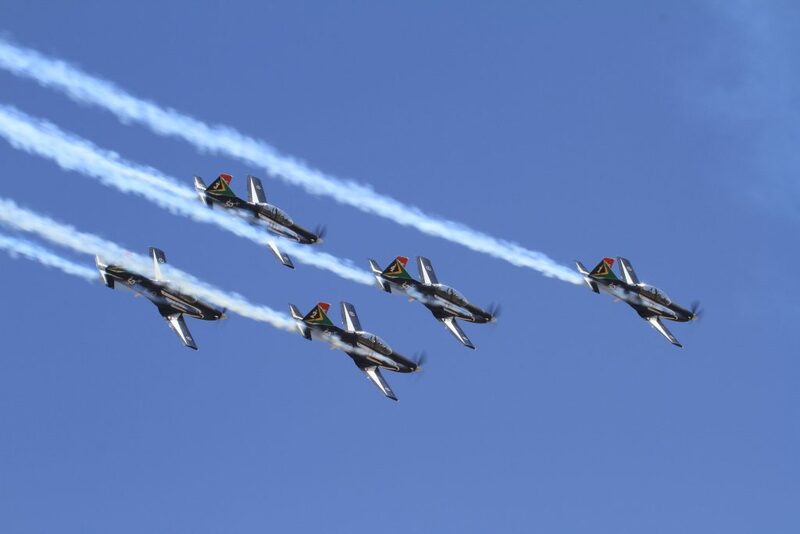 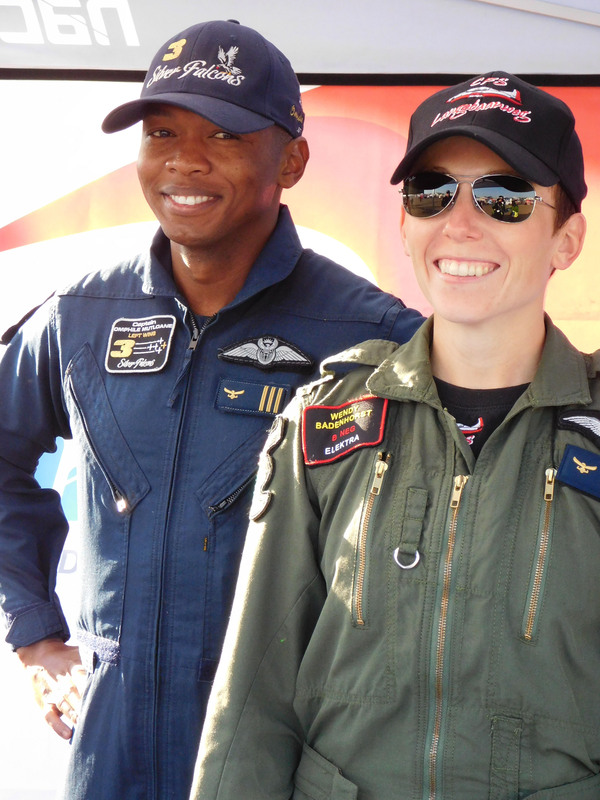 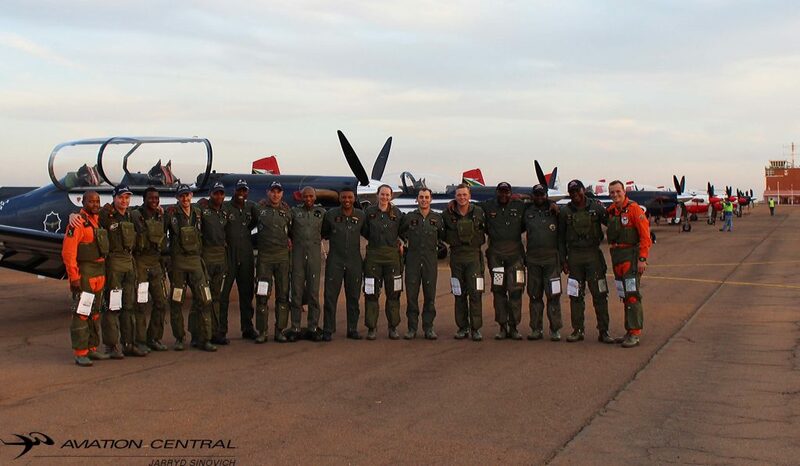 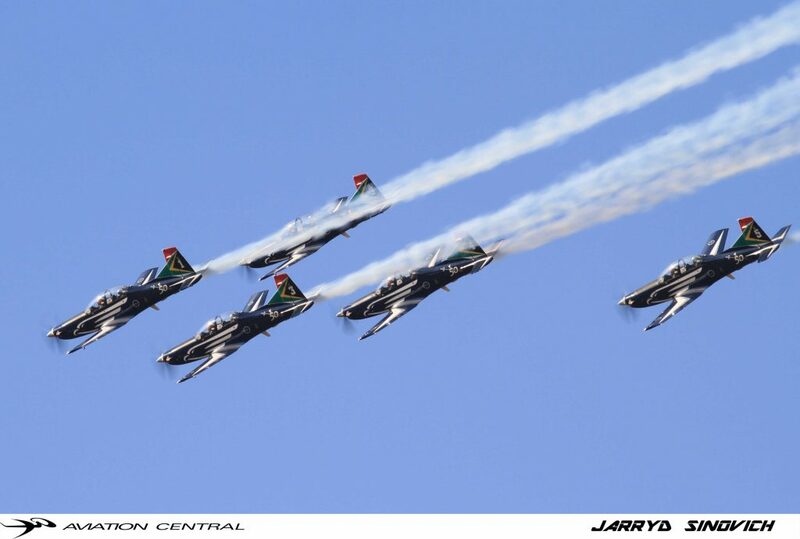 Omphile will take command of leading the team from the 2018 SAAF Museum Airshow on the 5th May.This will be team 82,as we saw Mark’Katana’Gentles leave team once again after Armed Forces Week in Kimberly in the Northern Cape earlier this year as the former leader. 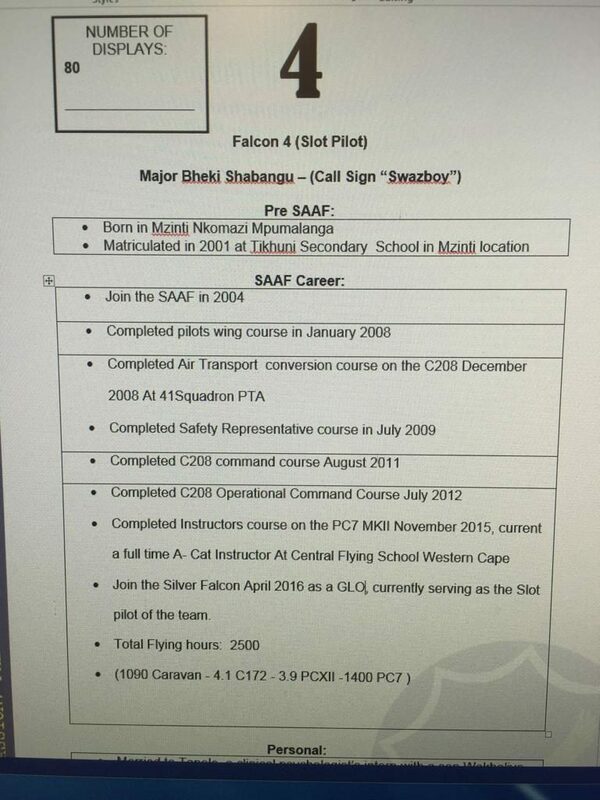 Some of falcon 5s hobbies interests include him being a serious book worm who loves history and a avid marathon runner. 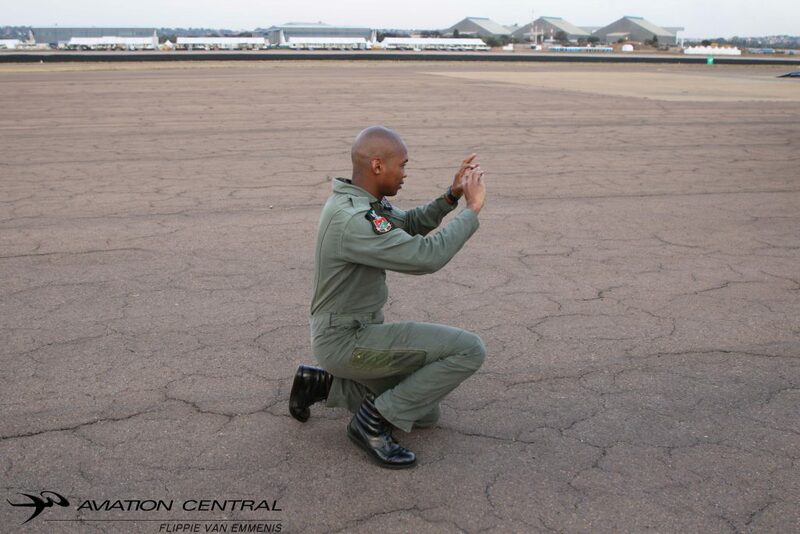 He will be competing in his second comrades Marathon in KZN in month or so time. 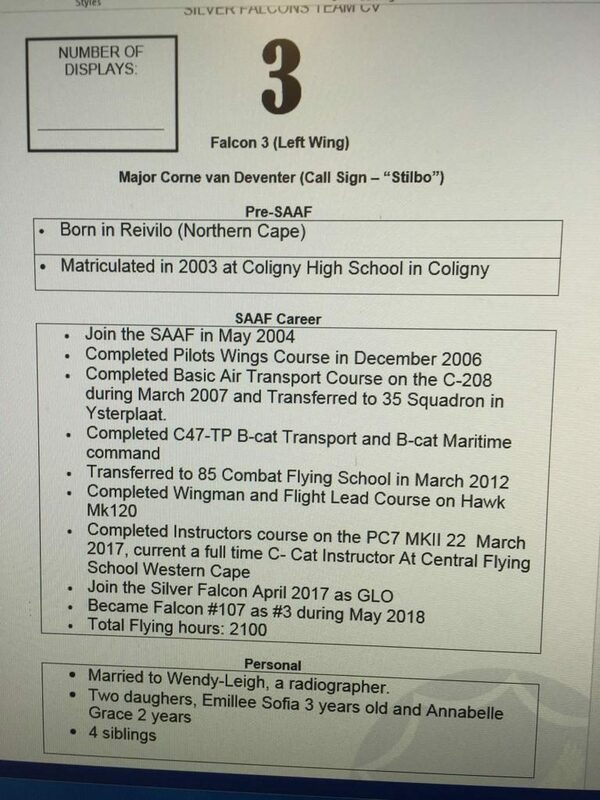 Wish him all the best of luck!